There are a few things that should never mix - Peanut butter and mayonnaise, eggs and ketchup, & conversations and public restrooms, to name a few. 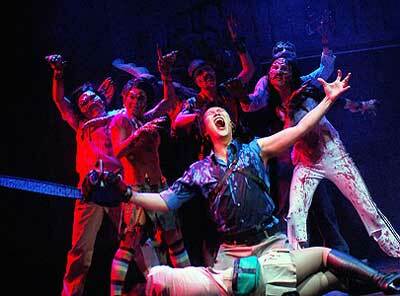 Well, back in 2003, a Canadian theatre company had the guts to mix what should never be...horror and showtunes. I have a long history with the Evil Dead series. When I was 11, my brother rented Evil Dead 2 and left it in the VCR one day. So one lazy Saturday I watched it in its entirety. I think I even watched it twice. I have my brother to blame for my love of all things horror. I love the entire series, even the first one, which was designed to be a straight-up scary movie, even though it's low budget and buckets of blood make it unintentionally hilarious. So you can imagine my happiness when I found out there was an entire musical production based on the first movie. I don't have too much experience with musicals. (i.e. I avoid them) The only musicals, other than terrible grade-school plays, I have seen live are Wicked and Hairspray. Does that mean I have to turn in my Man Card? Or does it mean I get to keep it? Since becoming a semi-popular off-Broadway musical in 2006, this Evil Dead production has gone on the road to perform for its handful of fans nationwide. More recently they've traveled to Salt Lake City, which is where I got the chance to see it. You should know what you're getting into when the price of the tickets is broken down into two distinct categories - General Admission and Splatter Section. Yes, this musical has a splatter section! It's like Sea World's splash zone, but with blood. Being true fans, my friend and I paid ten bucks extra to sit in the splatter section. The theater was the size of a modest high school amphitheater, and every inch of the first 10 rows was covered with thick saran wrap. The opening number was actually pulled from Rocky Horror Picture Show. An obese version of Dr. Frank-N-Furter came out and sang "Sweet Transvestite." This was essentially passing the torch of the cult status of Rocky Horror to the Evil Dead musical. Before Frank-N-Furter finished his/her song, Ash came out and shot him with a shotgun and he exploded a small balloon with dark kool-aid. It was time for the show to begin. The cast performed their first song in a prop plywood car about how excited they were to have fun in a cabin in the woods. Early on, you could hear issues with the PA system. For each musical number the background music was incredibly loud and their mics were turned down low. I thought it would be a problem they'd fix after the first song, but apparently it wasn't an issue for them because it wasn't fixed. The problem with that is that much of the randomness and humor comes with the song lyrics. But because we couldn't hear them, everyone just had to politely chuckle every time it sounded like there was a funny line. The songs are very hit and miss. There are a few highlights such as "What the F$%# was that?! ", "Join Us" and "Housewares Employee." Most of the songs needed some help (or a melody) like "Look Who's Evil Now", "Bit Part Demon" and "Do the Necronomicon." You can tell from the song titles, that this musical isn't meant to be taken seriously. And I'd be fine with how over the top the songs get, if they were only better quality, even hum-worthy. The second problem with the show comes down to the blood splattering. The movies spoiled us by shooting fire hoses full of blood at Ash. In the musical, there is a lot of carnage, but it essentially comes down to someone getting shot and the victim breaking small blood balloons into the audience. I loved the clever nods to the movie series' inconsistencies. 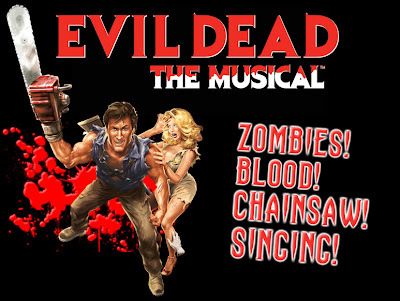 The first half of the musical directly followed the plot of the first Evil Dead. When the stage went dark, Ash was surrounded by bodies and was holding a shotgun. After the intermission, the stage lit up and the bodies were gone and Ash had his trusty chainsaw and shotgun. This is a wink to fans who've always wondered about the remake/sequel aspect of Evil Dead 2. The best part of the musical was, I hate to regret this, the trees. If you're familiar with Evil Dead, you know what the trees do. Without saying too much, there is a dance number that ends with an Eiffel Tower. (I'm hoping Just Jim is the only one who knows about that act.) Oh, and the splatter section is rewarded with silly string. Let your imagination do the work. As the musical was about to end, I was very disappointed that no "splatter" had reached our seats. Not to worry, during the final musical number, the cast put on blood backpacks connected to super-soakers. One of them walked down my row and sprayed everyone's laps with a steady blood stream. So, I walked out of Evil Dead the Musical hoping to be covered in fake blood, instead it looked like I just had my period. I was glad that I saw this musical because I have been a fan of the series for most of my life. But will I every see it again? No, probably not. It was fun seeing it with a crowd of true fans. They cheered loudly every time Ash said one of his classic one-liners. 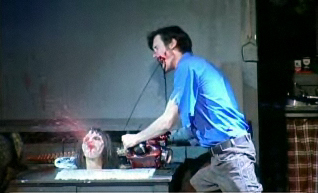 Many people will say I'm missing the point, that an Evil Dead is supposed to be low-budget to mirror the movies. But it missed the whole fun aspect the movies deliver. 3 things could have improved this musical - more blood, catchy songs and a better sound system.